All former communist countries undergoing transitions to market economies have faced the difficult question of whether or not to compensate those whose property had been confiscated by the previous, now deposed, regime. If a country determines that it will give compensation, it must then decide who will be eligible, how much compensation will be given, and what form it will take. In this paper we focus only on the issue of whether compensation should be in the form of restitution— the returning of property to the previous owners— or whether it should be some form of indemnification— the term we will use to designate compensation in the form of some asset (usually financial) other than the actual confiscated property. While economists may be divided as to whether compensation of some form may increase efficiency, they are nearly unanimously in favor of indemnification over restitution. The argument is a simple one. Transition economies need to privatize quickly. Under a policy of restitution, title to property is not clear until claims are settled. Privatization must therefore wait for the resolution of property claims. Under indemnification the resolution of claims can proceed independently of the process of privatization. Most transition economies seem to have ignored this advice. Countries that made up the former Soviet Union have not given any form of compensation— perhaps not surprising given the long time period since confiscation. The countries of Eastern Europe, however, have compensated previous owners, and the preferred method— with the notable exception of Hungary— has been restitution (Travieso-Díaz 1995, Castañeda and Montalván 1995). We can imagine two possibilities why actual practice has deviated so much from what has been recommended. One possibility is that non-efficiency considerations are dominant. As economists, we do not know how much we can say about such considerations. In any case, we have so far not heard non-efficiency explanations we find convincing. A second possibility is that economists have overlooked ways in which restitution may actually enhance efficiency. The purpose of this paper is to put forth just such an argument. The traditional argument against restitution ignores the fact that privatization takes place within a political context. Privatization creates not only winners, but also losers. The losers will be those who run state enterprises, their political bosses, and perhaps part of the work force. Some of these are politically well connected persons who are likely to lobby to delay or sabotage privatization, or to skew the process in their favor at the expense of efficiency. They are a powerful special interest group whose interests are the opposite of successful privatization. Restitution creates an opposing special interest group— the previous owners— whose interests are in speeding up privatization, since they will be its primary beneficiaries. In serving as a countervailing force against those who would work to delay privatization, it seems plausible that they can offset the delays caused by the settling of claims under restitution. It may at first seem that testing such a hypothesis is straightforward. One need only compare how the pace and success of privatization has varied across countries using the two methods of compensation. We do not know if the necessary data exist. So far we have not found them, but our research is still in its preliminary stages. Even if such data exist, however, there are remaining difficulties. Among them is that the differences across countries that lead them to adopt different compensation strategies are also likely to affect the pace of privatization. 1 To correct for such “selection bias” we need some sort of model of the political process as concerns the method of compensation used. Such a model can also be an alternative, indirect, way of testing the hypothesis that we have put forth. If it is successful in explaining features of the privatization process, including perhaps which countries have chosen which method, we would gain confidence in the hypothesis. In this paper we provide a very simple, “bare bones” model of the political process concerning compensation and privatization in a previously centrally planned economy. The political process will have two levels. One level is that of general rules of the game, such as whether restitution or indemnification should be used. It seems to us that if the work of social scientists can have any influence, it is at that level. Once the rules are set, however, we view political decisions as being completely endogenous, and our role becomes descriptive and explanatory. In section one we present our model of privatization with indemnification as the method of compensation. The model is based on the work of Becker (1985) on political influence. We stress that the work here is very preliminary. Section two introduces restitution and analyzes how it affects the pace of privatization. In section three we look at the political equilibrium under restitution, and analyze how the pace of privatization depends on the fraction of the economy that is in private hands before the transition. We suggest that the larger is the private economy at the beginning, the more likely indemnification will be chosen as the method of compensation. We discuss some standard extensions in section 4, and how we believe they will affect our results. We briefly discuss in section five two alternative explanations for why countries may choose restitution. We conclude with a proposal for how to utilize the pressure group benefits of restitution in a system of indemnification. where Im>0 and Iw<0. The variable x represents the institutional framework. It is reasonable to assume that Imm<0 and Iww>0. The former guarantees that the second order conditions for the maximization problem of the manager of a state enterprise (see below) are satisfied. The latter is actually required by the second order conditions for the maximization problem of a worker/consumer (see below). Since we have no strong prior on the interaction of Em and Ew in I, we will make the simplest assumption, which is that they are independent, i.e. Imw= 0.
where RmE is the partial derivative of Rm with respect to Ew. The function Rm is shown in figure 1. As can be seen, Rm(Ew,θ;x) is upward sloping with respect to Ew, so that the more lobbying that is done by worker/consumers, the more that is done by the managers. 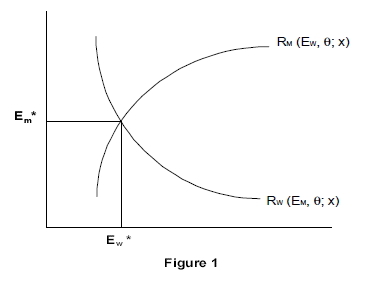 The intersection of the two reaction functions in figure 1 determines the equilibrium amount of lobby ing for each group, Em* and Ew*, which in turn determine how long the privatization process will take, T=I(Em*,Ew*;x). where I0, α, and β are non-negative constants, it can be shown that time to privatize, T, declines as θ rises. This is reasonable because the special interest wishing to delay privatization, the managers, is smaller the greater is θ. We now assume that restitution is the form of compensation used and consider how the previous equilibrium is altered. Restitution creates a special interest group, the previous owners, whose aggregate lobbying, Ep, is directed at speeding up privatization. For now we treat Ep as exogenous. where τ is additional time involved in resolving property claims. We assume that the function I(Em,Ew,Ep;x) takes on the same values as before with Ep= 0. We also assume that Ip< 0, Ipp> 0, and Ipm= Ipw= 0. Treating Ep as exogenous, we can compute the effect of an increase on Em, Ew, and on T. The comparative statics are too messy to reproduce here, but we can show that an increase in Ep will lead to an increase in lobbying by both managers and worker/consumers. 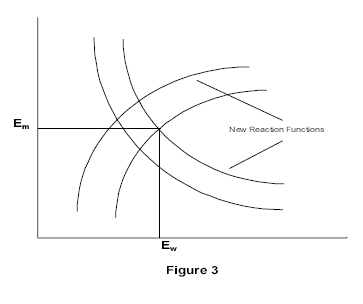 The effects of an increase in Ep on Em and Ew are shown by shifts in the reaction functions in figure 3. Besides the indirect effect on T through Em and Ew, Ep directly acts to reduce T. The net effect of an increase in Ep is to decrease T. Analytically, the effect on T of changing from indemnification and restitution is like increasing in Ep from an initial value of zero, and adding τ. The effect on T of lobbying by the previous owners may or may not exceed the additional delays in privatization imposed by having to settle property claims. The solutions to (4), (6), and (11) are three reaction functions, Rm(Ew,Ep,q;x), Rw(Em,Ep,θ;x), and Rp(Em,Ew,θ;x). 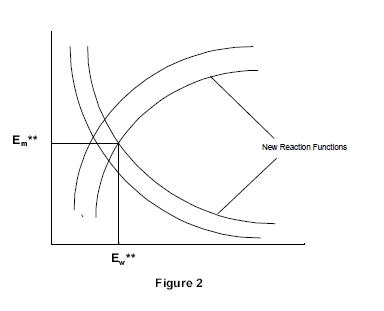 The solution to these reaction functions would determine the equilibrium levels of lobbying, (Em*, Ew*, Ep*). We do not yet have general comparative static results for changes in θ, nor even for the specific influence function in (8), suitably extended to include lobbying by the previous owners. We have done a few simulations for specific parameters for the influence function (8). A typical result is that under both restitution and indemnification the time until privatization is complete, T, declines with the fraction of firms. T declines more rapidly, however, with indemnification. If this results holds up more generally, a prediction of the model would be that the larger the relative size of the private sector at the beginning of the transition, the less are the gains in speeding up the privatization process by restitution. Since the speed of privatization is likely to be an important concern in choosing the method of compensation, we would then expect that the larger the private sector, the less likely a country would choose restitution as a means of compensation. The relative size of the private sector, θ, may affect the pace of privatization directly if it takes longer to privatize a larger government owned sector. It is not evident, however, that this would affect the weights given to lobbying by the various interest groups in the influence function. Consequently, this should not affect the decision of whether to use restitution or indemnification. By this reasoning, the time added to the privatization process for settling claims under restitution, t, could also be made a function of θ. τ would be a decreasing function of θ, so T would decline more rapidly with increasing θ under restitution, than if τ was constant. This may seem to have the potential of reversing the simulation results discussed above, but we believe the basic outcome— that indemnification is more desirable the larger the initial size of the private sector— will remain unchanged, at least for some simple, but reasonable, functional forms for τ. We have also assumed that the gains and losses to the various groups from privatizing do not directly depend on θ. This is unlikely to be the case, because the value of θ will affect the equilibrium wages and profit prior to the transition, and therefore affect the magnitude of the changes brought about by privatization. Specifically, we expect that the larger is θ, the less is the gain to worker/consumers from privatization, and the less the loss to managers. Both groups have less incentives for lobbying. Presumably this would give greater weight to previous owners. The owners of private firms at the beginning of the transition, however, could now be hurt by privatization, and they would have an incentive to lobby to delay it. While not denying that these direct effects of q on the surpluses of the various groups, it is our belief that these are of secondary importance. It is sometimes suggested that a reason why restitution may be used by transition economies is that it places less financial burden on already strapped government budgets. While it is true, of course, that restitution saves the government indemnification outlays, it also denies in revenue from privatization. In principle one should be able to design restitution and indemnification programs that have the same impact on a government’s budget. We do not see this as a viable explanation. An alternative explanation has to do with the possibility that capital markets in a transition economy may be highly imperfect. 9 With well functioning capital markets, it should not matter from the point of view of efficiency, whether government firms are auctioned off or returned to previous owners. They will end up in the hands of those who value them most in either case. This will not necessarily happen if capital markets are highly imperfect. The best people to run the firms, for example, may not be able to obtain financing to purchase them, and so there will be an efficiency loss. Under these circumstance returning property to previous owners may result in a better assignment of ownership and control than would be achieved through the market. If this explanation is correct, we should see considerable restrictions on the return of property. For example, previous owners may be required to run the firms returned to them, or make a minimum level of investment. 10 Previous owners who for health reasons or obsolescence of knowledge of their industry could not run their previous firms, would not have them returned to them. Heirs would presumably not have claims to property, unless there was some presumption that they would make good owners. We do not know to what extent these types of restrictions have been present in transition economies using restitution. A related argument involves the resulting distribution of wealth if capital markets are highly imperfect. It may be that those who end up purchasing government owned firms make windfall gains purely because of their superior access to financing. These windfall gains may accrue primarily to foreigners. Restitution, to the extent it involves nationals, would avoid this. A problem with this explanation is that when government assets are sold off, only the windfall gains, and not the entire value of the properties, go to the purchasers. With restitution, the entire value normally goes to the recipient. In the case of Cuba most of the recipients of restituted property would be expatriates, whose wealth levels on average far exceeds those of residents of the island. Restitution would seem to further skew the distribution wealth. We have argued that restitution of property in a transition economy may enhance efficiency by creating a special interest— the previous owners— who have an incentive in speeding up the privatization process. This group serves to balance the pressures exerted by the losers from privatization to delay the process. Furthermore, we have taken the first steps in constructing a model that could help explain what countries choose what method of compensation, and that would eventually allow us test our hypothesis indirectly. An implication we hope to eventually develop, and which we have given some suggestive arguments for, is that an economy is more likely to choose restitution the smaller is its private sector prior to the transition. We would like to close with a suggestion. One way of incorporating the desirable feature of restitution in a program of indemnification would be as follows: indemnify owners, but do not begin settling a claim until the property involved has been privatized. Privatization need not wait until claims are settled, but yet the previous owners have an incentive to speed up the process. For the latter effect to work as with restitution, the amount of indemnification would have to correspond to the selling price of the property involved. This has the potentially useful result of bringing into the privatization process private information previous owners may have about the strength of their claims. Becker, Gary. “Public Policies, Pressure Groups, and Dead Weight Costs,” Journal of Public Economics 28, (1985), pp. 329-347. Castañeda, Rolando H. and George Plinio Montalván. “Economic Factors in Selecting an Approach to Expropriation Claims in Cuba,” working paper. Travieso-Díaz, Matías. “Some Legal and Practical Issues in the Resolution of Cuban Nationals’ Expropriation Claims Against Cuba,” Journal of International Business Law, 16 (2), (1995).